Help Thanks Wow: The Three Essential Prayers. Anne Lamott. Riverbend Books: New York. Hardbound, $17.95. 102 pages. 2012. www.riverbendbooks.com.au. Stitches: A Handbook on Meaning, Hope and Repair. Anne Lamott. Riverbend Books: New York. Hardbound, $17.95. 96 pages. 2013. www.riverbendbooks.com.au. Good things really do come in small packages! Don’t let the length of Anne Lamott’s Help Thanks Wow: The Three Essential Prayers and Stitches: A Handbook on Meaning, Hope, and Repair fool you. They are both chock-full of wisdom and good counsel for people of all faiths who are seeking guidance in their spiritual lives and their relationships with God and others. The author has written several previous books on these topics, but never before in such depth. 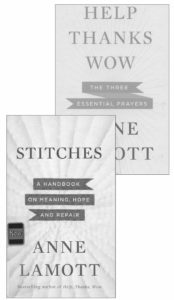 In Help Thanks Wow, Lamott offers three simple prayers that she claims will “get you through tough times, everyday struggles, and the hard work of ordinary life,” coalescing everything she has learned about prayer in her life and written about in earlier books, including Traveling Mercies and Grace — Eventually. Lamott begins by defining prayer in the section titled “Prologue: Prayer No. 1,” then continues by describing each of the “essential prayers” in depth, including examples and anecdotes from her own and others’ lives. “Help” is asking God for assistance; “Thanks” is appreciating the good we receive and witness that flows from God’s grace; and “Wow” is feeling awe at the world, God’s creation. Lamott fans will treasure this book — one of her best — and readers new to her will engage with her insightful and honest approach to spiritual self-care in general and prayer in particular. 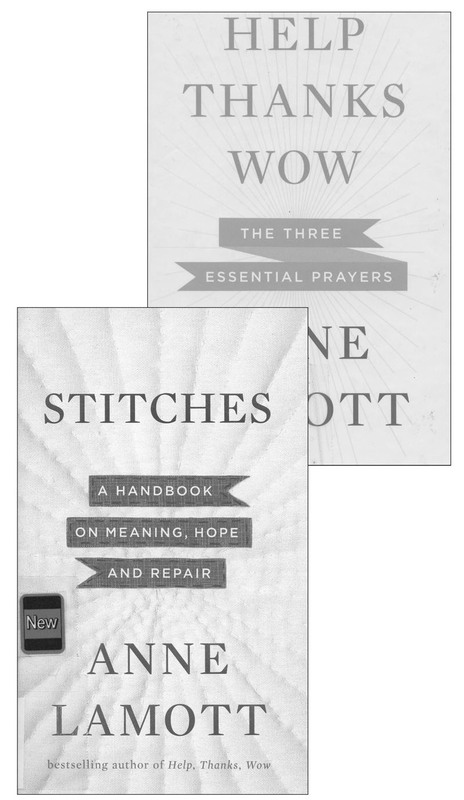 Lamott’s Stitches was published within a year of Help Thanks Wow. The author uses the analogy of life as a patchwork quilt — a collection of the remnants of our emotional and spiritual fabric — and the ways we sew them back together, one stitch at a time, using the “stitches” of strength, warmth, humor, and humanity. Lamott provides guidelines on how to make sense of life, what to do when life becomes unbalanced and seems to be spinning out of control, and how we can reconnect with one another in a world that does not value compassion or empathy. She does not offer simplistic checklists or flow charts — a “one size fits all” formula — but, rather, a thoughtful, intuitive approach to dealing with life’s challenges. Stitches is not a true sequel to its predecessor book; however, the two volumes could be read consecutively or even concurrently. Either or both would be excellent resources for a book study, adult forum series, or support group for people dealing with transition or emotional healing in their lives. Coralyn (Cory) Bryan is a freelance writer and editor who lives in south Minneapolis, where she is a member of Holy Trinity Lutheran Church (ELCA). She is also a Metro Lutheran proofreader.